The Moors National Park Centre, Danby. Using all the nous and wisdom accumulated over years of walking these lands, I figured that the high moors would be a dry option compared to the wintry slop of valley fields. You will not be surprised to hear then, that within 200 yards of the start I was up to my shins in a vast and icy bog. This six-mile walk was a partial reprise of the first ever Stroll with Stu penned for the Gazette some eight years ago. On that occasion, I got quickly and inauspiciously lost, but recommended an alternative start on the A171 at the Liverton Road end, a mile east of Scaling Dam – a thoroughly commendable if slightly damp piece of advice. I should add here that I also retrieved my original map for this walk. Now, this was my first attempt at drawing maps on Microsoft paint (I was scared of Ordnance Survey Copyright lawyers), and frankly it is a bit, er, abstract. It’s a scale thing really and I ask you to estimate distances with caution. Daffodils by the rail line, Danby. There is a bit of a giveaway in that Ainthorpe wouldn’t fit in the space I’d left between Danby and Castleton, so with due apologies to the residents, I rubbed it out. I’m confident that the water table will soon descend below ground, so drop down the embankment and through a gate onto the moors. The obvious route strikes out to a visible cutting, but this is not the path. meant to take ironstone from East Cleveland to the thriving ironworks at Glaisdale. Funds ran out and only fragments, such as this cutting, remain to show that this was a sound idea when it was originally conceived on the back of an 1870s beermat. The path you need bears slightly right. Indistinct at first, it soon becomes clear as it heads south. Danby Beacon, away on the horizon, should always be significantly to the left of your route. The swampy bit – Sandy Slack on an OS map – is betrayed by long reedy grasses. (Heather only tends to grow on the relatively drier bits). A map of the walk. There is actually a footbridge over the wettest section, but on my visit that bridge would have needed a 200 foot extension. Hopefully, you won’t need a snorkel and can follow the path into drier territory after that bridge. It should be OK for most of the summer, honest! I was delighted to see that the lone Scots pine tree has survived the last eight years. It is a reassuring feature on the path which now climbs slowly to meet the tiny road heading left towards the beacon. Cracking views of the Fryupdales grace the route as you cross the road and drop gently to your right. Soon – quite close to the Danby Road – turn sharp left along a track which skirts Clitherbeck Farm. Stay on the track above the farm and follow it as it curves right high above the pretty and rather wild valley on your right. Waymarks indicate paths down into the dell, but you should stay on the wide track admiring twittering skylarks and angry curlews imploring you to get orff their laaand. There was a muddy sheep competition going on as me and my mate Simon squelched our way across this stunning little bit of North Yorkshire. It was a difficult decision, but we went for a specimen that looked like it had been stood behind a muck-spreader for the last three weeks. Simon came a close second. The path emerges onto the road that climbs up from Danby to the beacon and while we could have chosen a prettier route, the creatures between our toes needed liberating so we dropped down the Tarmac to the excellent Woolly Sheep café at the Moors National Park Centre (pictured above) for tea, tiffin and a sock change. 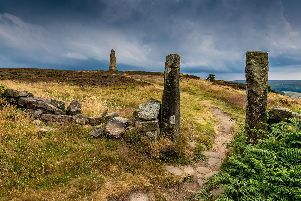 The moors centre at Danby Lodge is always popular and will offer bundles of fun throughout the summer for kids, mums, aunts and grannies, while Dad spends his time wondering how long it would take to walk back to that nice looking pub in the village. This is a handy hub for the Moorsbus, to which I am happy to give an unashamed plug. It will soon restart bigger and better than last year with buses on Fridays, Saturdays and Sundays throughout the summer, snaking all over the moors and starting/returning to Teesside, Thirsk, Saltburn, York and Northallerton. The volunteers who work their socks off to bring this service to you, deserve several medals. Finally Dads, I can reveal that it takes about 12 minutes to sneak away round the terraced gardens, out of the top gate and left along the road to the Duke of Wellington pub in Danby village. You won’t be missed for two hours.